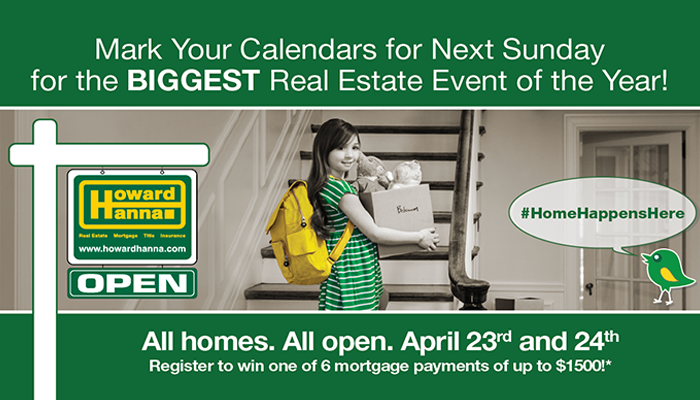 Cleveland, OH (April 18, 2016) – Howard Hanna Real Estate Services has always believed in the power of open houses and every year in April, the company hosts the biggest real estate event of the year with thousands of open houses in different price ranges, styles and locations. This year’s open house event takes place Saturday, April 23 and Sunday, April 24 and celebrates the well-known real estate company’s newly unveiled tag line, Home Happens Here™. According to the National Association of REALTORS, 88% of buyers purchase a home through a real estate agent or a broker, and 45% of them use open houses to make the decision on which home to purchase. This means that despite living in a digital world, open houses continue to be an important part of the real estate industry. Howard Hanna agents hosting the open houses will be available to offer not only information about the home, but also insight into the local housing market and neighborhoods. Additionally, Howard Hanna Mortgage Services will have Loan Originators available in all Howard Hanna offices to answer questions about the home buying and selling process and mortgage programs. For more information and to view open house listings, visit: http://www.howardhanna.com/BigEvent. *One winner in each Howard Hanna market: Ohio, Pittsburgh, Erie, Harrisburg, Virginia/North Carolina, and Michigan. Winner will be selected by random drawing in each of the 6 locations listed from all entries to win one cash prize consisting of the equivalent of one month’s mortgage payment up to $1,500 maximum on the winner’s new home mortgage (taxes and insurance not included). Winner(s) must purchase their home through Howard Hanna, finance through Howard Hanna Mortgage (Pennsylvania, Ohio, Michigan) or Towne Mortgage (Virginia, North Carolina), and close with Barristers Land Abstract or its affiliate, completing the sale on or before October 31, 2016. Howard Hanna Real Estate Services is the #1 real estate company serving Pennsylvania and Ohio and the 4th largest real estate company in the United States. The family-owned and operated real estate company specializes in residential and commercial brokerage service, mortgages, closing and title insurance, land development, appraisal services, insurance services, corporate relocation and property management. With 173 offices across PA, OH, VA, MI, NY, WV, NC & MD, Howard Hanna’s more than 6,200 sales associates, management and staff are guided by a spirit of integrity in all aspects of the real estate process.